There are many things that people spend a lot more time stressing over than actually getting done. One of these things is packing. Rarely have I seen such looks of terror on people’s faces as when I’ve asked them the unmentionable four words: “Have you packed yet?“ Even though, at the end of the day, you would think it’s really just a question of throwing a few clothes, bathroom items and a passport in a bag… right? However, as your placement lurks closer, suddenly creeping up on you, you too will most likely go through the packing-panic mode. When people start asking you the dreaded question, you will notice your eyes immediately darting to your feet, your mouth dry up to utter an almost inaudible “No“ with internal stress levels bubbling up like a British kettle at 5 o’clock. The issue of your unpacked suitcase quickly blows up out of control to become this disproportional and insurmountable problem in your mind. Horror scenarios of arriving at the airport without a passport start haunting your dreams and you spend every waking moment worrying about how all your things will fit in your bag. Of course we all know that at the end of the day, once it actually comes down to it, you are absolutely capable of throwing your favourite pair of jeans in a bag and while you will have crunched your brain over this process for weeks, after a few squeezes and tugs, your suitcase will be packed in no time at all and you will arrive at the airport. Be it security controls or just the fact that bathroom items live in the bathroom and we all have trouble removing them from their natural habitat, forgetting your favourite shampoo or shower gel when you just want to take your first shower before sleeping off your jetlag can be really annoying. You yearn for a nice fresh feeling after spending 14 hours on a plane. The thought of another second of grease cultivating on your head sends shivers down your spine. But then try not to forget that the people living in the country you have travelled to probably also have hair, so you might just be lucky enough to find some similar products in the country- probably even a lot cheaper! So you’ve already missed out on your shower and you go to bed grumpy wanting to maybe send a short message to your family letting them know that (despite the lack of shampoo) you are well and safe. This is when you realise that your phone is dead and you’ve forgotten your charger. All seems lost. But don’t lose hope. Wherever you are staying, there are probably other people who have phones who can help you out and you can easily buy a new charger once you have slept off your jetlag. This is also a great way to start chatting to people and getting to know your new environment and home. Another important thing we have all found ourselves forgetting is important documents – and probably the item we are most scared of not having with us when we are far away from home. So you left your health insurance card at home and need to go to the doctor or need your visa documents to get a working permit? As much as bureaucracy (or the lack thereof) in a foreign country can be stressful enough as it is, don’t despair if you don’t have originals on you. Often a scan will suffice, which your friends or family can easily send over. In the worst case, they can be sent over by telegraph or faxed too so don’t worry! While not having a certain document on you may delay certain bureaucratic processes, you can get them in to the responsible authorities in no time. Another frequent nightmare scenario that has not only surfaced in my dreams. I’ve arrived on holiday before realising with absolute horror that I have forgotten my inhaler. Although I only have very weak asthma, the mere thought of not having my inhaler was enough to keep me breathless. However, it is important to know that wherever you are, you can always go to a local doctor and get a new prescription of a similar drug. If you know the name of your medication in your own language, doctors can usually find the local equivalent in instants. You can also call your home doctor and ask for a new prescription which can be sent to you. So there are plenty of ways to sort this out. Depending on where you’re travelling to, the first thing you might want to do is throw on your swimming trunks or bikini and run into the deep blue ocean. But wait, you’re sure you put it in with your underwear, you check again… and again. You either give up defeated or face buying a random swimsuit you find in the nearest shop. But who cares? You might find something really nice or be that person with the pineapple swimming shorts who can tell a funny story of how he bought them off the street before running to the beach on his first day. Don’t forget your time abroad is special and all these experiences form part of the journey! In the evening, especially at the beginning, you might feel a little down about being far away from home. Missing your family and friends, you want to flick through some memories in your photo album but then you remember that you left it in that box under your bed. Suddenly, the distance between you and your friends and family seems larger than ever and the 5000 miles between you suddenly stretch to a solid 50000 as you feel a pull in the pit of your stomach. As nice as it is to have some memories of your loved ones with you, you don’t need them to feel connected to them. Maybe actually calling the people you care about when you miss them, rather than looking at nostalgic memories, will make you grow closer. You can share your amazing experience abroad by speaking to people on Skype, writing a blog or sending voice messages and you will feel that while you are collecting all these new memories, you are still connected to those you care about – wherever you are! And if you are really desperate, aren’t phones these days miniature photo albums anyway? The people working on your project are organising a first getting-to-know-each-other party. While you excitedly get ready, you notice that you didn’t bring that amazing shirt everybody always compliments you on which would go great with the jungle theme of the party. Don’t worry. If you want something exciting, why don’t you find a new top that’s even more outrageous! Your time abroad is a time to rediscover yourself, and you can get to choose to be whoever you want! Shopping can also be a great way to explore a different culture and you are bound to find some hilariously extravagant items along the way. Alt hough money is one of the most important considerations when going abroad and something you will need to plan in advance, you might find yourself at the airport realising you forgot to bring the right amount of cash or that you have money in the wrong account which you cannot access abroad. However, there are quick and easy ways of transferring money even abroad. Also, don’t forget you will be in a network of people happy to help you if you need help setting up a new bank account so you can receive money from your parents or to just lend you some money until everything is set up. So really, as long as you don’t forget your personal identification, you have nothing to worry about and packing really isn’t such an issue. While the process of worrying about what to pack and whether to bring the red or the blue case can be prolonged for weeks on end, the actual act of throwing your favourite pair of jeans in a suitcase comes down to one day at the most. So why do people worry so much about packing when it is really quite straightforward? For one, I think we are all scared of being in an unknown environment and that is why we want to surround ourselves with familiar objects. As such, we might find it hard to part with clothes we know we don’t wear anyway, cards and letters we received months ago, photos and cushions. We are afraid. And secondly, worrying about packing is a good way to divert our attention from what we are really worrying about, like living in a new country, starting a placement, living on our own, potentially starting a long-distance relationship… And suddenly, “How will I find friends?“, “What if I don’t enjoy my time abroad?“, “How will I cope with being away from my friends and family?“ translates into “Oh my god, what am I going to bring?“ So in fact, when people ask you “Have you packed?“, they’re not really asking about the contents of your suitcase but whether you are prepared to take the step you are about to take, whether you’re ready. 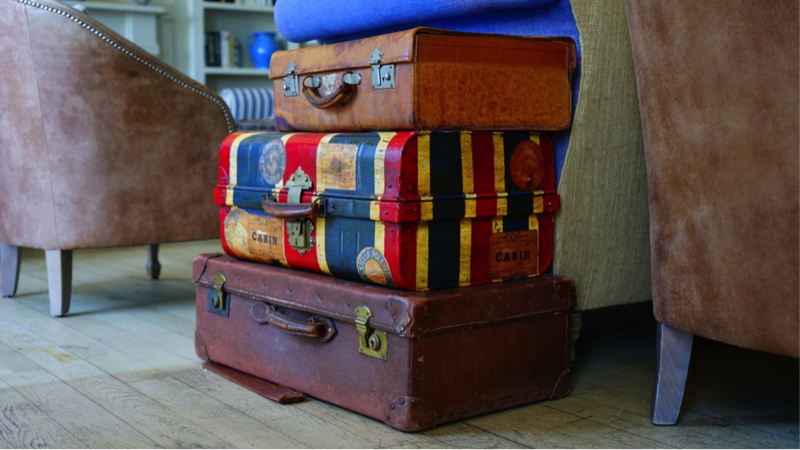 And while these more important questions are definitely what will race through everybody’s mind just before going abroad (however certain they are of going), it is important to remember that packing really is just packing. Taking all your cinema tickets to stick on the wall and the dress you wore for your graduation party isn’t going to make you feel any more at home when you arrive. Much rather it is about the new experiences you make there. And even if you forget something vital, you can buy things in your new destination. And if it’s not available where you are, it’s probably not even that necessary and you’ll survive without it. Check out the 50+ Professional Internships, Volunteer Projects and TEFL Programmes that Global Nomadic offers in 30 countries worldwide. Now that you know what not to pack, why not check them out? Lily Parsey is a 3rd year Arts and Sciences student at UCL with a passion for travelling and exploring cultures around the world. In the coming year, she will be undertaking a placement abroad in Shanghai. Speaking five languages, she enjoys learning languages as the key to intercultural communication.